My mother-in-law hates me and makes no bones about it when she and I are alone. My husband doesn’t believe me, and she even gloats about that. We have to attend family functions at her home about once a month. (It used to be more frequent, but after I put my foot down, my husband agreed that monthly would be sufficient.) The problem is that after each visit, I wind up with a bad case of diarrhea; my husband does not. 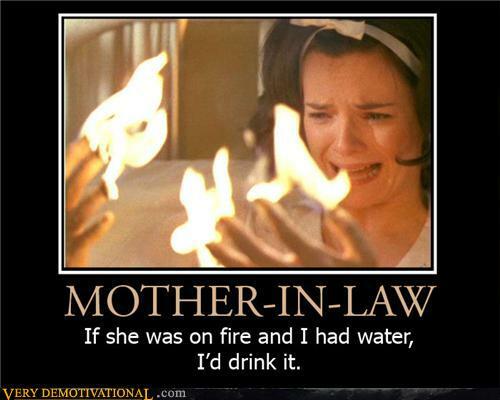 I don’t know if the other in-laws are affected, because if I asked, it would get back to her. I suspect that my mother-in-law is putting something in my food or drink. Last time, I barely made it home before being struck down. Now I am considering getting some “adult undergarments” to make sure I don’t ruin the car’s upholstery on the ride home from her place. Do you have any other advice? I understand your concern. Unless you switch food plates with your husband, I would stick with the drinks. Hope this helps.. This entry was posted on March 18, 2012 at 2:25 pm and is filed under Uncategorized. You can follow any responses to this entry through the RSS 2.0 feed. You can leave a response, or trackback from your own site.